'Shakespearean Drama' At Viacom As 5 Board Members Are Ousted : The Two-Way Media mogul Sumner Redstone, 93, has moved to replace five board members of Viacom Inc., including the chairman and CEO whom he has considered a surrogate son. Sumner Redstone attends a film premiere in Los Angeles in 2012. 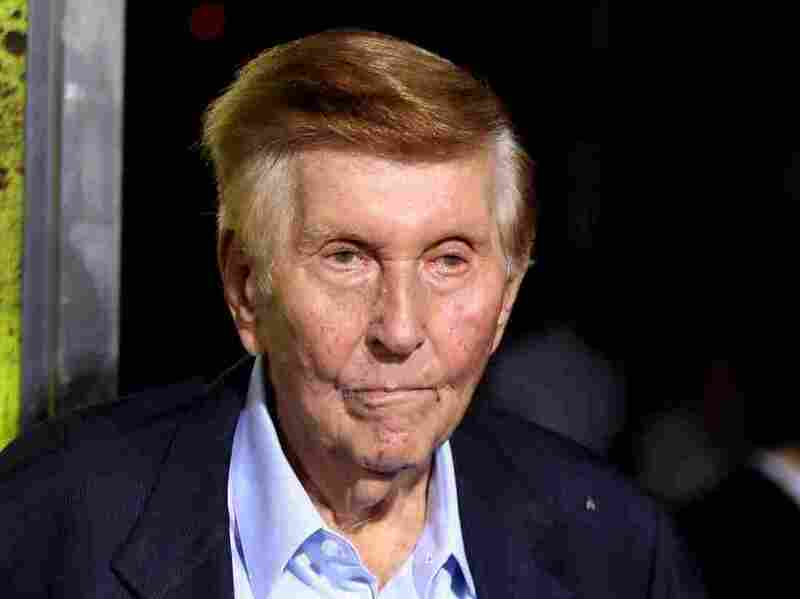 Media mogul Sumner Redstone has moved to replace five board members of Viacom Inc., including the chairman and CEO whom he has considered a surrogate son. A statement from Redstone's National Amusements, Inc. – Viacom's parent company – said simply that the five were "removed" and replaced with five others who have "deep experience in corporate governance of public companies." "You've got Sumner Redstone, he's now 93 years old... he's the figure who assembled Viacom and also the CBS corporation. His protégé, his lawyer for many years, his advisor and counselor for three decades — kind of a surrogate son — Philippe Dauman, is the CEO and chairman of Viacom. And he's tossed him off, not only now off the Viacom board but also National Amusements, which is Redstone's holding company through which he controls both Viacom and CBS. "This is a battle that's pitted Dauman, in a sense, against the daughter, the long-estranged daughter of Sumner Redstone, who has in recent years reconciled with the media mogul. And so you see a surrogate son and a once-estranged daughter battling for control of the future of this media empire." Folkenflik says the two may be at odds because of "the desire of Shari Redstone to control the future of this company, and Dauman clearly doesn't want any part of that." But at the same time, Dauman's leadership has come under fire in recent months. Former Viacom CEO Tom Freston called for new leadership in an interview with David earlier this month: "It went from really being No. 1 in its class, as a cable networker and as a creative enterprise, to pretty much the bottom of the barrel." Dauman "has been criticized by analysts and investors alike for failing to keep up with changes wrought by the internet on Viacom's TV networks like Comedy Central, MTV and Nickelodeon," as The Associated Press reports. National Amusements is privately held by the Redstone family and owns nearly 80 percent of the voting shares of Viacom, according to corporate statements. National Amusements said it had filed papers with the Delaware Court of Chancery to affirm the changes on the board. In its statement, it says it asked the court to maintain the existing board until it affirms the changes. Dauman remains CEO, the company says. But as Reuters reports, Thursday's move "could be a prelude to the 93-year-old media mogul forcing Dauman out of the company entirely." Likewise, one of the ousted board members has filed a lawsuit in an effort to stop his ouster, All Things Considered reported. Redstone is also fighting accusations in a Massachusetts probate court that he is "not mentally competent ... and was in effect being manipulated by his daughter Shari," David added. In summary: "What you have here is a corporation whose upper management and currently-elected board is at open war with the family that ultimately controls the fate of this company. And it's very hard to see a clean resolution for the current leadership of Viacom, even if they managed to find a way to prevail," David said. Redstone stepped down as executive chairman of the CBS board of directors in February, as The Two-Way reported.